The device pictured above is something that Sprint is hoping to have available to users before any other wireless carrier according to rumors circulating on the Net. The device is a femtocell. It's usage is pretty simple. You plug this device into your broadband connection and it allows you to use a 3G device over broadband. 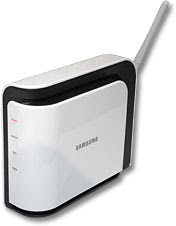 If you don't have a good mobile signal in your home or office, this device works as a booster allowing you to get great coverage and using broadband instead of a wireless signal. The neat thing about this device is that it not only works with voice, but with 3G data as well which is a big plus if you need a data connection on your phone as well as voice.